In a world that is increasingly driven by intellectual pursuits and specialized skills, educators, parents, scientists, and students all share interest in improving the factors that support academic success. Panamath, a software program that estimates the precision of an individual's "number gut," is a free resource that helps in this endeavor. A person's number gut, or Approximate Number System (ANS), specializes in the "ballpark" figure rather than an outright calculation. It's what lets us see which grocery line in a store is longer, or which part of the movie theater has fewer people. Animals have this ability as well, without any training from humans: a bird picks the branch with the greatest amount of berries or a baboon decides he's better off not fighting a gang of six. The ANS empowers us to decide the most efficient course to take in everyday situations and may impact our performance in school mathematics. Panamath measures your ANS through a simple task. You're repeatedly flashed two groups of dots—one blue and one yellow. After each flash, you're asked, "Which one had more?" This enables Panamath to calculate how precise your ANS is. After you've finished, the software generates a personal results file for you to view or store for later analysis. To date, over 100,000 people have used Panamath. The individuals in this group ranged from three-year-old children to adults in their early 80s. Thus far, these data have resulted in two main findings. The precision of the ANS drastically improves across an individual's lifespan—being imprecise yet still observable at birth, undergoing a rapid period of improvement from the teens to the 20s, reaching an optimal accuracy around age 30, and progressing through a gradual decline in later adulthood. This trend can be seen in Figure 1, which shows the average Weber fraction of individuals at different ages (bars represent the range from 10th to 90th percentiles in the population). The Weber fraction allows us to measure how precise a person's ANS is. The lower the number, the better the precision. 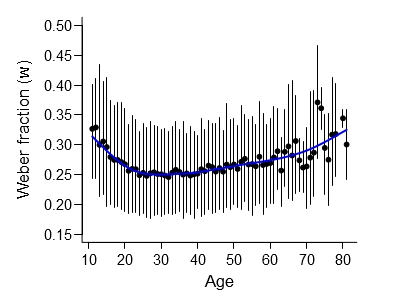 Figure 1: Average Weber fraction (w) of individuals at different ages. Bars represent range from 10th to 90th percentiles of w in the population. Lower w means better precision of the ANS and better performance on Panamath. The age of the lowest average w is 30. The precision of one's ANS predicts how good he/she will be in formal school mathematics. See Figure 2 for more details. Figure 2: Linear regression of the standard score for 64 14-year-old children on the WJ-Rcalc test of symbolic maths achievement and the acuity of the ANS (w). Higher numbers on the WJ-Rcalc test indicate better performance, whereas for Weber fraction, lower numbers indicate better performance. Adapted from Halberda, Mazzocco, & Feigenson, 2008. At every age tested, the student's report on his/her math ability, based on standardized testing, correlated with the precision of the ANS. Recent research using Panamath also showed that the performance of three-year-old children predicted how well those same children did in math class at ages six and seven (Mazzocco et al., in preparation). It also appears that the precision of the ANS, as assessed by Panamath, was impaired in children who are struggling with math learning. This was not the case with average or high-achieving kids (Mazzocco, Feigenson, & Halberda, in press). There are currently different studies that address questions involving different aspects of Panamath. How does precision in the ANS change? What are the mechanisms behind these changes? Are they naturally occurring or do they arise from experience in a certain culture? How do we improve our ANS? And, even if we do, will this actually improve our scores in math? Finally, how are Panamath and other activities that engage the ANS integrated within school curricula? These questions are being pursued in our own lab and independently in other labs that use the Panamath software freely in their own research. We hope that further research and collaboration with Panamath will lead us to the answers. If you are interested in taking the test for yourself now, go to either the brief demo or to the full online version of the test. You can also download the full version to customize and use Panamath on your own computer or in your own research. The downloadable version of Panamath is a free, self-standing software that can run on Windows, Mac, or Linux. There are default settings in the program that you can change according to your subjects. Upon completion of the test, Panamath generates two output files: a reader-friendly PDF that explains the subject's results and an XLS file containing trial-by-trial accuracy and response time data and stimuli parameters. The results files will be saved to your own computer. You retain all rights to any data that you collect, and we cannot access your data. If you are a scientist or educator who wants to use Panamath in your own research lab or classroom, there are many free resources on this website that will help you in your studies and assessments, including our Resource Wiki. Note that Panamath is intended for professional use only. Use of the Panamath software is subject to these Terms and Conditions. The program may not be used for any sort of monetary gain. Halberda, J., Mazzocco, M. & Feigenson, L. (2008). Individual differences in nonverbal number acuity predict maths achievement. Nature, 455, 665-668. Halberda, J., Ly, R., Wilmer, J., Naiman, D., & Germine, L. (In preparation). Precision of the approximate number system correlates with self-reported maths ability across the lifespan. Mazzocco, M., Feigenson, L., & Halberda, J. (In preparation). Early approximate number system acuity predicts later math performance.